Your smile is completely healthy – except for one problem tooth that’s bothered you your whole life. The back molar on the right side has had a cavity since you were a child, and the decay has progressed. When you see your dentist in Spring, TX, Dr. C. Gary Simmons, he tells you that putting in a new a filling is not enough – you need a dental crown. Although you’ve heard the term before, you’re not sure what this is or how they work. Dr. Simmons answers all your questions about this superior dental treatment in this article. 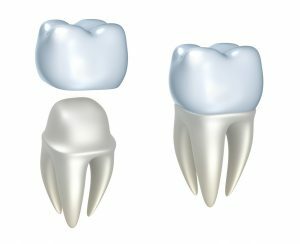 Dental crowns are tooth-shaped “caps” that fit over your existing teeth or a dental implant. They are made of durable, biocompatible porcelain that blends right in with your natural smile. What Are Crowns Used For? Your tooth has extensive decay and a filling is not enough. Your tooth is injured or broken. Your tooth is weak and needs reinforcement. Your tooth is misshapen and you’d like an aesthetic upgrade. You have a missing tooth and are getting a dental implant. What Is The Process For a Crown? Dr. Simmons will see you twice to complete the process. In the first visit, he’ll prepare the existing tooth and take impressions of the area. He’ll send the information to the lab to custom create your crown. Then, you’ll have a temporary crown attached and use this until the permanent one is done. In the second appointment, you’ll have your permanent crown placed. With the high-quality porcelain used by our labs, we have remarkably long-lasting results for dental crowns. Research has shown that 97% of crowns were still intact at 10 years, and 85% were still working perfectly at 25 years. With proper care, these replacements can last almost indefinitely. Can I Afford A Dental Crown? Dental crowns are a necessary dental service that is usually covered by insurance. We accept the vast majority of plans and are happy to verify what your specific benefits are. If you’re worried about a gap in coverage, we accept CareCredit financing. Please let us know if you have any questions about the financial side of your restoration – we’re here to help. Now that you know what dental crowns are, how you can receive one, and what they can do for your teeth, schedule your appointment with Dr. C. Gary Simmons today to make your smile radiant again.